Gladbach have now lost just once in their last seven Bundesliga outings, and the win – with Thorgan Hazard and Mathias Ginter scoring to drown out Arturo Vidal’s consolation – saw the Foals canter to within five points of the early-season pacesetters. While coach Dieter Hecking must take a dollop of the credit for his work from the dug-out, on the pitch, the sizzling form of Hazard has been the main catalyst for the team's charge up the table. For many years, the only time Thorgan Hazard and his elder brother Eden were in the same ball park was when they played football together in the back garden of their family home in Belgium. Now, the Gladbach talent stars alongside the Chelsea man for their country with the younger Hazard no longer merely ''the brother of…"
It would have been difficult for Belgium boss Roberto Martinez to ignore Hazard, whose talents may have taken longer to come to the fore than his sibling's, but were nonetheless always there. 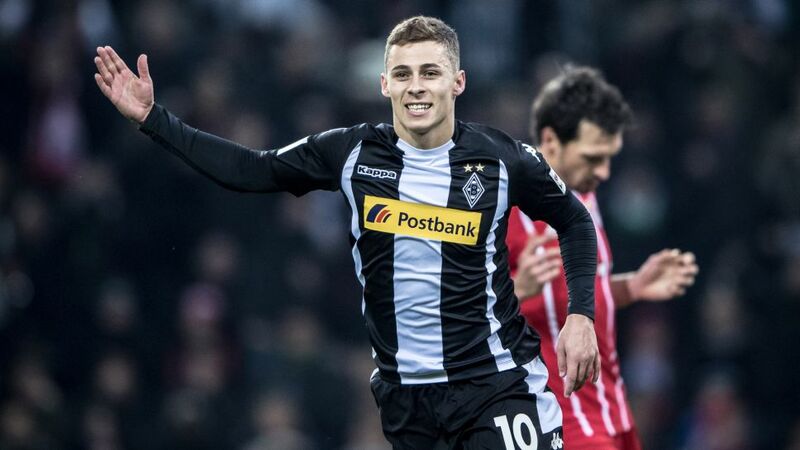 As Thorgan himself rightly pointed out when he joined Eden at Stamford Bridge in 2012, "it is not like they just sign every player’s brother". Bundesliga defenders can confirm there is substance — at times terrifying for them — behind the 24-year-old's star surname. Bayern were just the latest team to find that out with Hazard netting his fourth penalty of the Bundesliga season — and fifth goal in total — in his team's victory at the Borussia-Park. His strike – sent past Sven Ulreich with a dash of fortune – means that Hazard is the first Gladbach player to be involved in a goal — scoring or providing the assist — in 10 successive league games since records began in 1992. Hazard was vibrant throughout, covering some eight miles with a game-high 35 sprints – 10 more than second-best Joshua Kimmich – as Dieter Hecking's men became the first team to dent the 100 per cent record of Gladbach's former goalscoring darling, Jupp Heynckes. The record Bundesliga champions had won all five league games under Heynckes since the former Real Madrid and Bayer Leverkusen boss replaced Carlo Ancelotti to begin a fourth spell at the helm of the team. However, Gladbach's own form and Bayern's poor record against the Foals — they have won just six of the duo's last 16 Bundesliga encounters — means the title race has been blown open once again. Hazard, meanwhile, has lost just once in six appearances against Bayern. He has flourished under the worshipful gaze of Gladbach's fans on home soil, scoring two goals and providing three assists in his last five outings. Those eye-catching stats — rather than his qualities as a lucky charm against Bayern — are not the only reason Hazard is all but certain to maintain his top-flight ever-present tag in his club's starting line-up. "I like the way he plays football," said Hecking recently of the artful attacking midfielder, who is his team's top goalscorer ahead of Raffael and Lars Stindl. "He really runs a lot and is a very consistent player who can always create situations. For that reason, I'm absolutely delighted with 'Toto' this season."